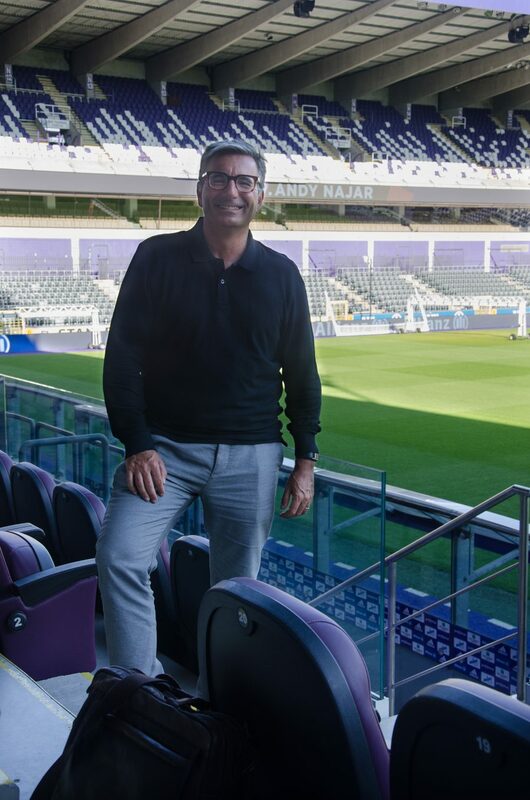 The creation of Exqi Sport and the RSCA Media platform. We do not take ourselves too seriously, we laugh at ourselves and we take the quality of life very serious. Good food and drinks is an essential component of our country. We are the queens and kings of surrealism. Toots Tielemans, Eddy Merckx, Jacques Brel. I am very subjective. I am half Italian. San daniele in Ganshoren is my Favourite but La Belle Maraîchère and Le Vismet are excellent also. I would start at La Place Sainte Cathrine, Rue du Lombard, Grand Place, National Library, Sablon, Place Poelaert, Marolles and back to Place Sainte Catherine. Why? Because you have a great historic impression of our city. Mayonaise OR Sauce Américaine !!! At Friterie De CORTE, the best Friture in the world. The old men do not respond and remain quiet. The American thinks that they must me Flemish and asks the same question with even greater difficulties in Flemish. The two old men do not react. The American tries in English but the two pensioners do not answer. The two old men remain quiet for another hour. Suddenly one old man says; “have you heard the guy? he masters 3 languages…” his friend responds: “true but that will not bring him very far”.